We arrived in Male, the capital of the Maldives, at 4 a.m. in the morning, bleary eyed. We had a bit of a rough flight (delays, being awake for most of it) but we were going to paradise? We thought we had entered a strange parallel universe where normal people had been abducted by aliens and replaced with their super nice versions. We were greeted by the radiant smile of our guide from Cocoa Island who was collecting us at this late hour. Cocoa Island was to be our first stop in the Maldives. Full of energy and zest, we felt guilty for being slightly irritable and braved the conversation. "Let's take the boat" he said, brightly. As I looked down in the water to board the boat, I marveled at the shoal of Tiger fish flitting about in the transparent water ... he just laughed" It's much better at Cocoa," like it was as common as seeing cows grazing in a field. We raced across the pitch black waves; it seemed very melodramatic, and glamorous, like something from a James Bond film, with only the twinkle of the stars above us. When we got to Cocoa Island we were shown to our accommodation. Although, even after being awake for 24 hours, accommodation was not nearly a good enough word to describe what was perched on the crystal clear waters before us. It was a "dhoni" boat, a traditional wooden fisherman's boat painted in the deepest blue and brown. It stood before us like a work of art. We didn't know whether we should really be sleeping in it or just admiring its design. It was just the tip of the iceberg however, when we entered, the interior of the boat further seduced into the seafarer's way of life. We looked on in glee and lusted after the lounge complete with cream Italian sofa and polished soft wooden flooring throughout. We walked out to an unbelievable terrace looking straight out onto the ocean - its little wooden steps descending into the blue waters. We were almost too excited to sleep, and it was late as we flopped on the cool cotton sheets. The next day I woke and with sheer excitement raced down the stairs to the terrace. 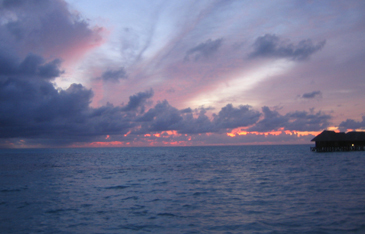 The daylight afforded the most amazing view of the Indian Ocean in all its glory. 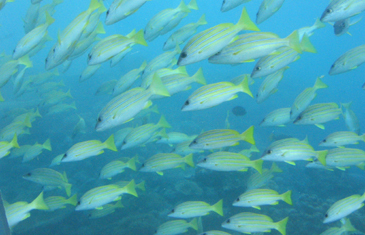 Looking down from the floor, I could see what seemed like hundreds of brightly colored fish swimming around the boat, glistening in the sun. There was not a cloud in the sky. I looked to my right and saw a line of six other boats, all edged into the Ocean. We walked to breakfast, looking curiously at the baby sharks (lots of them) cruising around the shoreline. After an organic delight of a breakfast, we went snorkeling. I decided to stay longer by myself, it was teeming with fish. Out of the corner of my eye I saw something a bit bigger than your average cod. It was a shark. Not a baby one either. More like a mother size. I scrambled for the deck, feeling stupid after as there has not been one single shark attack in the Maldives to date. Well, you never know. Everyone's seen Jaws. Cocoa Island was a small, powder white island, quiet and serene. It was simply perfect. The staff was so laid back and friendly, they seemed to genuinely love us- I wondered if there were any vacancies as I contemplated my return to Seoul. We watched as some off duty staff played soccer on the beach. I had a relaxing massage in Como Shambhala, the spa, and nearly drifted off to sleep, as it was so good. Using essential oils, the full body Shiatsu massage was medium to firm pressure and took away all the tension in my back. The masseur used his palms and elbows to apply the firmer pressure and it worked wonders. I took a yoga class later on the beach (oh what a stressful life) There were only three people in the class including me (I have about as much flexibility as a plank of wood). Our yoga instructor had a calm and manly demeanor. Practicing the heron-like poses proved a bit difficult for someone with zero balance such as me but he helped me (a lot) and afterwards we sipped ginger tea and looked out to the aqua blue sea. Dinner was an Indian banquet beyond belief, less spicy than expected, this array of fish and beef curry, pilaf rice, and roti was delicious and the service was unobtrusive. We sat at a table in the sand and could hardly prize ourselves from our seats. After our brief visit to Cocoa, we set off to our final destination, The Hilton on Rangali Island. The difference between the two resorts was huge. As Cocoa Island was a small, quiet, island with only a few luxury dhoni's available to stay in, Rangali Island was the mother of the islands. The size of Rangali Island and its accommodation were vast and the amount of restaurants dizzying. To get there we took a seaplane which was another James Bond moment. We were greeted by the pilot (who was navigating the plane barefoot), he seemed like he was just chilling out and playing with his new toy. The seaplane was tiny and we could see right into the miniature cockpit, all the dials and levers seeming complicated. Once we took off the plane felt light as a feather. We looked out to the islands scattered below, huge bright turquoise expanses of ocean dotted with islands and coral formations. To see the Maldives from this vantage point was magical. Swiftly, we arrived at Rangali Island as lightly as we had set off. 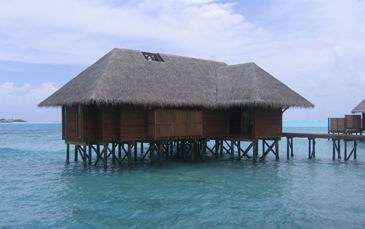 We were escorted to our water villa, having just been newly renovated, they were beautifully constructed. Even the wooden walkway look pristine and flawless, we felt like the first people on it. The villa itself was nothing short of sheer decadence. You name it. It was available. It was like an expose on the life of a slick, affluent traveler, someone who had the Louis Vuitton matching luggage, perhaps called Miles, maybe from Chelsea. It was a far cry from living suburban life in Seoul. We opened the door to the king-size bed, draped in the finest white cotton sheets and adorned with beautiful tropical flowers. Walk in wardrobes, a bathroom so big you might get lost in it (and it had two sinks) and a vast terrace overlooking the rippling ocean. I had to prop myself against the wall to steady myself. The amenities here were second to none, every night we ate in a different restaurant and it never failed to serve high quality, fresh and delicious dishes. 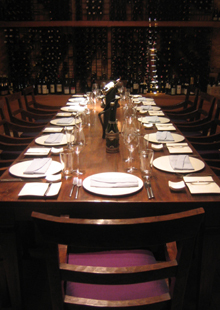 Reena took us into the wine cellar where dinner parties are sometimes hosted, it was small and elegant and the wine list was outstanding. After the shock of the price of the most expensive wine here, Chateau Petrus at $35,000 a bottle, we consoled ourselves; after all at that price we'd feel guilty drinking it, right? But some people do buy it and if you're a high roller then the chieftain of international luxury, the Hilton, is definitely the choice. It was hard to say goodbye but this girl had had a taste of being a princess for a while, in paradise. Rooms ... sorry Dhoni boats come in two different styles. Dhoni standards have a split level bedroom/seating area and large bathroom. Dhoni loft suites have a mezzanine level featuring an ensuite bedroom, as well as a large living room, and bathroom. Both boats feature a private sun deck. There is also four one bedroom and two, two bedroom villas available. 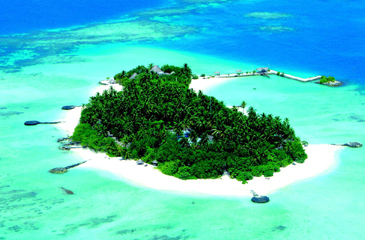 Cocoa Island has a restaurant, Ufaa and a bar, Faru. Ufaa serves a daily changing menu of Indian and Sri Lankan blended food. The Como spa serves up a fantastic array of massages and treatments, all in a quiet and intimate setting. The island is small and discreet and is just the ticket for people who want to get away from everything. The staff are amazingly attentive yet unobtrusive. It has a comprehensively stocked library, internet, yoga facilities, gym, water sports and dive centre and a coco shambala spa. One of Christina Ong's projects, only the design savvy need apply in this slick resort. Ultra cool style in an uber hip resort. This is the stuff dreams are made off. Just kick back on your hammock and listen to the sounds of the waves. Check www.cocoaisland.com for current rates and special offers. 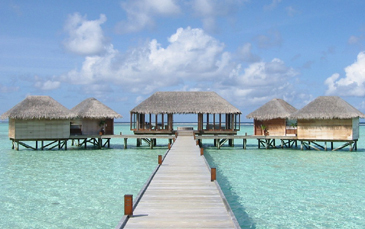 Rooms start with reasonably priced beach villas. They all include a courtyard with fountain, large outdoor garden-bathroom and glass doors where the walls should be. The suites are completely self-contained and surrounded by a natural lagoon. They all have wooden interiors, private sun deck and espresso machines. 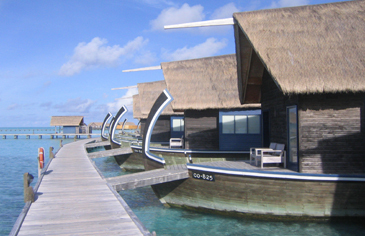 The executive rooms feature 21 spa water villas, essentially a self-contained resort-within-a-resort. Each villa has a separate treatment room. There are seven restaurants to choose from on the island. They cater for literally every culinary taste. Atoll Market is a sprawling buffet style restaurant with Indian, Chinese, Japanese, Italian and BBQ style fare. Sunset Grill serves up fresh seafood and steaks. The highlight, however, has got to be Ithaa Undersea Restaurant. It's the world's only all glass under sea restaurant with 360-degree views of the wild and wonderful surrounding reef life. There's a wealth of things to do on the islands, choose from lounging on any one of the beaches, fishing, fitness room, jet skiing, jogging track, table tennis, swimming pools, pool table, sailing, scuba diving, sightseeing tours, tennis courts, water skiing and windsurfing. Literally breathtaking, this is the ultimate splurge. For utter decadence, check www.hilton.com for current rates and special offers.